The Election Petition Tribunal constituted to hear the petitions arising from the Osun State governorship election has granted an ex parte order to Senator Ademola Adeleke, restraining the Independent National Electoral Commission from altering election results as well as information contained in the card reader machines and other documents used for the poll. The tribunal , headed by Justice T . A . Igoche, which also has Justice P . A . Obayi as member , granted this order in Osogbo on Thursday during its sitting before the commencement of pre - hearing session. Adeleke , who was the governorship candidate of the Peoples Democratic Party had, through his counsel , Mr . Nathaniel Oke (SAN ), filed an ex parte application seeking leave of the tribunal to file the application before the pre - hearing session . The applicant also sought leave of the tribunal to inspect and obtain certified true copies of electoral documents and materials in the custody of INEC; an order to conduct physical inspection and verification of electoral materials and machines , as well as used and unused ballots , among others. Adeleke also applied for an order to compel the INEC to produce and print out list of permanent voter card distribution statistics per polling units and an order restraining INEC from altering extracted information from card readers, election results from polling unit level to state level, as well as ballot papers used for the conduct of the governorship election in Osun State . 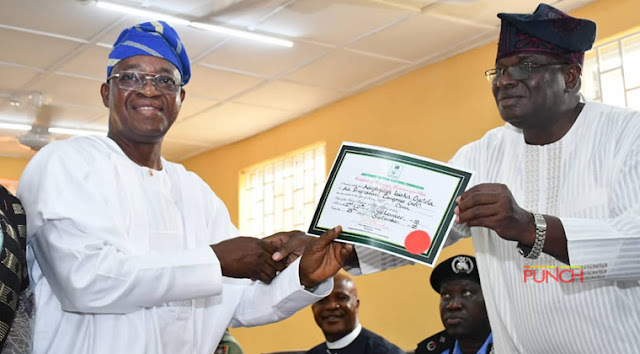 Adeleke predicated his application on the grounds that he was the candidate that contested the election held on September 22 , 2018 and the re- run election held on September 27 , 2018 on the platform of PDP . Other grounds of the application are : ” That the total votes won by the 1 st applicant on the 22 nd day of September, 2018 was 245 ,698 while the 1 st respondent scored 245 ,345 . “That the 1 st applicant was the winner of the election and ought to have been so declared by the 3 rd respondent ( INEC ). That the 3 rd respondent declared the election inconclusive hence a rerun was conducted on the 27 th day of September 2018 . ” That the rerun election was marred by electoral violence, vote- buying, stuffing of ballot papers , multiple thumb- printing and voting and allocation of votes by the 3 rd respondent . That by the total actual and valid votes cast on the 22 nd and 27 th days of September 2018 respectively, the elections were won by the applicants . “That an examination of the electoral documents and election materials in the custody of the 3 rd respondent is required to determine the actual facts and records of the elections to maintain this petition. “ That the 3 rd respondent wrongfully declared and returned the 1 st respondent as being duly elected and winner of the governorship election , Osun State held on 22 nd day of September 2018 and the rerun election held on 27 th day of September 2018 respectively . The panel, having listening to the application moved by Adeleke ’s counsel held in their ruling that the allocation had merit and granted the all, I cation as prayed . Addressing the fear raised by the applicant that INEC might not respect the tribunal ’ s order except they were armed with a certified true copy of the order, Igoche said there was nothing stopping the panel from issuing the order to the applicant on the same day. There was heavy presence of armed policemen and operatives of the Department of State Service on the court presides and outside the court as security operatives were deployed to prevent destruction of the proceedings at the tribunal . Those going into the court premises were frisked by policemen from the police anti - bomb unit while vehicles were also thoroughly searched to prevent hoodlums from smuggling weapons into the place .